2014 saw the 30th Anniversary of the Miners strike. Unite Community Leeds has decided to launch this page, which is dedicated to the memory of the miners and their struggle. Unite Community has good links with the Barnsley branch of Unite Community, which is located in the NUM headquarters in Barnsley’s town centre. The branch runs an excellent community support centre, offering social security advice as well as education and training and, of course, campaigning on various local and national issues. Given the strong links to the mining industry in the town, members of Barnsley Unite Community are also involved in miners’ issues and events. Leeds Unite Community supports these initiatives, especially the Orgreave Truth and Justice Campaign (OTJC). Further details of this campaign can be found on the OTJC website and Facebook page. 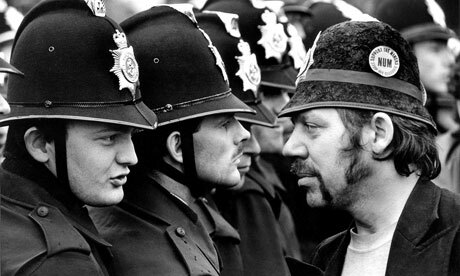 During the 1984 Miners’ Strike a confrontation took place between the miners and the police at the Orgreave Coking works where miners had gone to picket. There was an unusual level of violent policing that day and miners felt they had been set up by the police. Some miners sustained very serious injuries and many were arrested. During the subsequent court appearances of arrested miners on serious charges it was clear that the police colluded over statements and the trials collapsed. Despite all of this, no police officers have faced charges for their part in these events. The Orgreave campaigners are now pressing for a public inquiry despite having been denied one up to now.